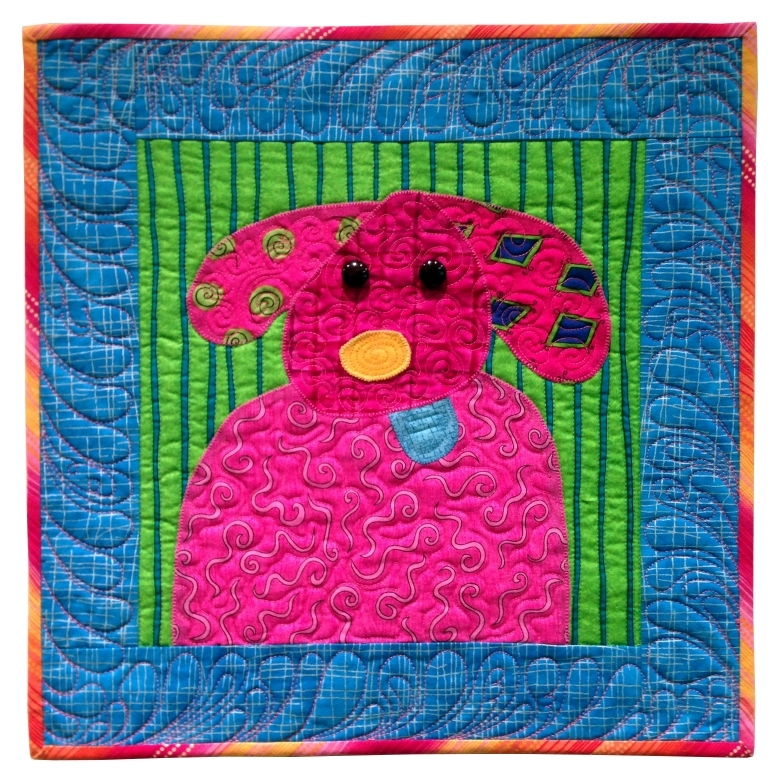 Adding another quilt today in the Old Dog: New Tricks Series. The original block, from my now de-constructed quilt, ended at the edge of the blue background and the bottom of the dog. I added a busy floral border and a simple cross-grain applied binding. To clarify, to make the binding I fold my fabric selvage edge to selvage edge. 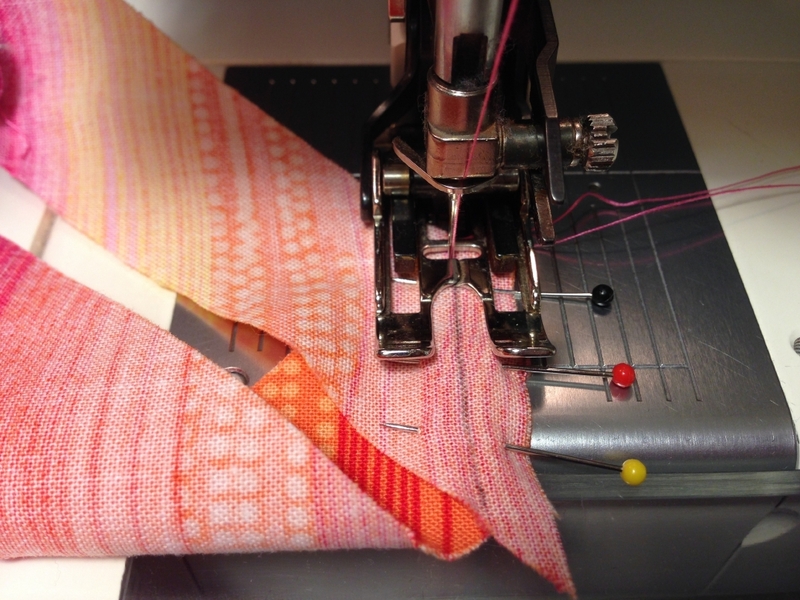 Then I slice the fabric as most of us do for patchwork shapes: perpendicular to the selvage edge. Each strip has the selvage edge on the short sides. 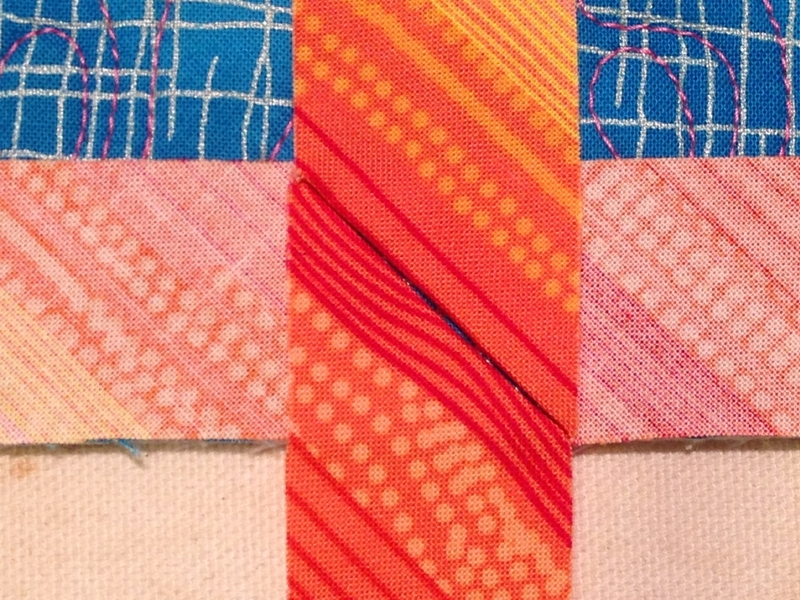 I find cross-grain strips have just enough “give” for straight-sided quilts. They’re faster than cutting binding strips on the bias. Trying new things with each of these little quilts is my goal. 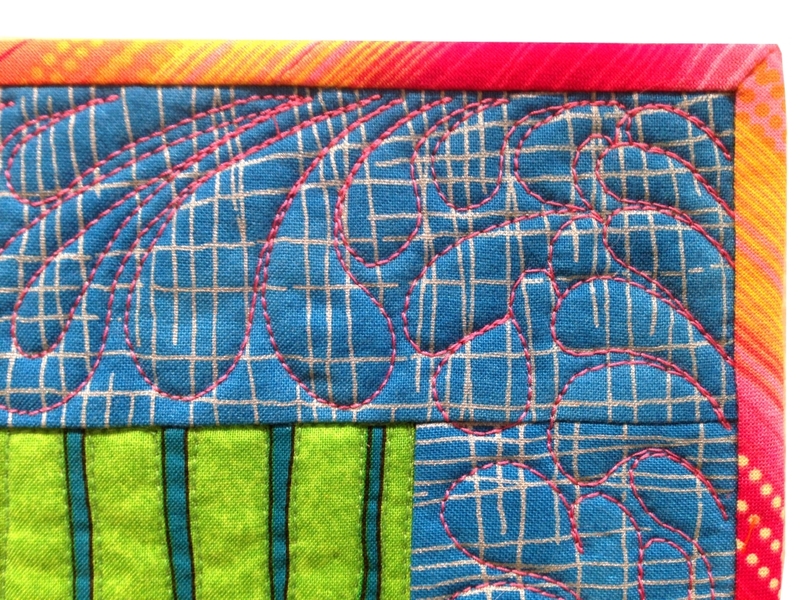 This time out I quilted straight lines in the blue fabric using my walking foot. I don’t think I ever quilted concentric squares before. The lines are 1/2″ apart. Rather than marking lines, I moved my needle to the left and used the edge of my presser foot as a guide. Although I traveled “in the ditch” along the edge of the dog to get to the next quilting line, there were still plenty of starts and stops. Each pair of threads (beginning and ending) were hand finished. I threaded them onto a hand needle, wove them in between existing stitches, and then buried them in the batting. I quilted around the spiral motifs in the green fabric (dog’s body) in pale green thread. It looks better from the front, but here’s a picture of the back where you can see the stitching more easily. Until I run out, all the quilts will have the paw print fabric as backing. I traced a nickel and then attempted to free-motion quilt on the lines, making the circles in two passes. (One pass in violet, the other in teal in the photo below.) Like I said, I’ll do better with more practice. While the dog’s ears are quilted, I still have a hard time quilting through their faces. 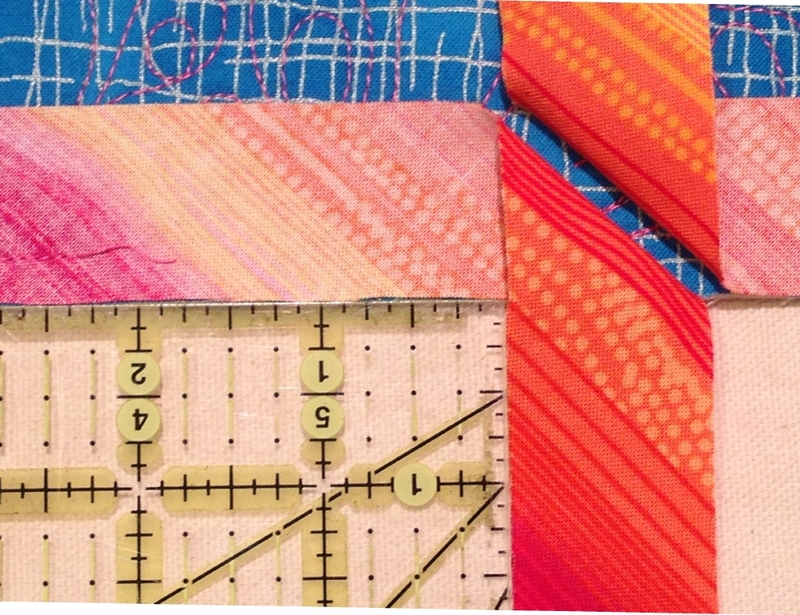 There’s more “quilty” stuff at AmiSimms.com. 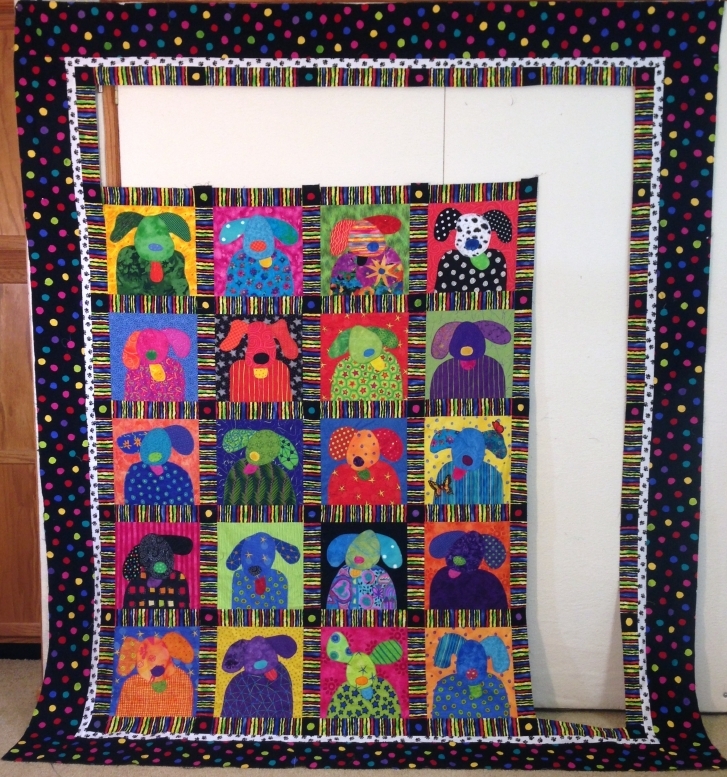 Here’s the first quilt created in the “Old Dogs, New Tricks” series. Pretty basic stuff. I’m just getting my feet wet. I added a blue border and bound it with a 1/4″ binding. It measures about 14″ square. 1. 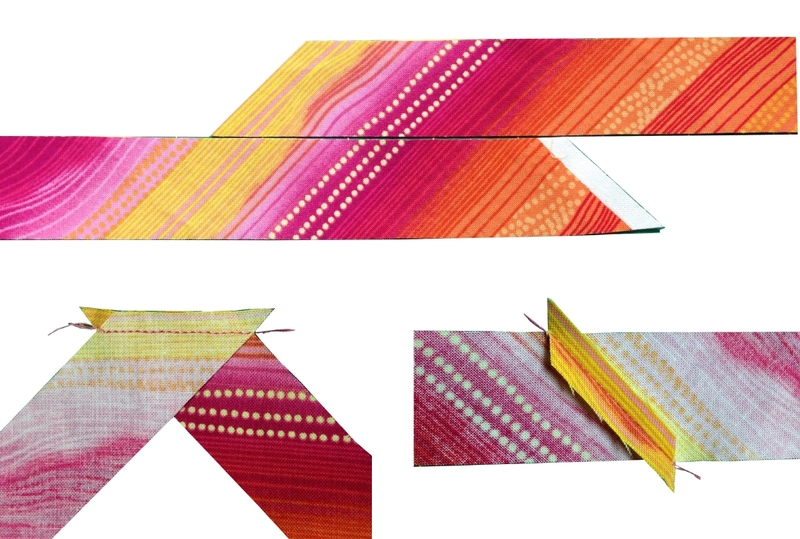 Believe it or not, I don’t ever recall making a bias binding using striped fabric with the stripes at an angle. 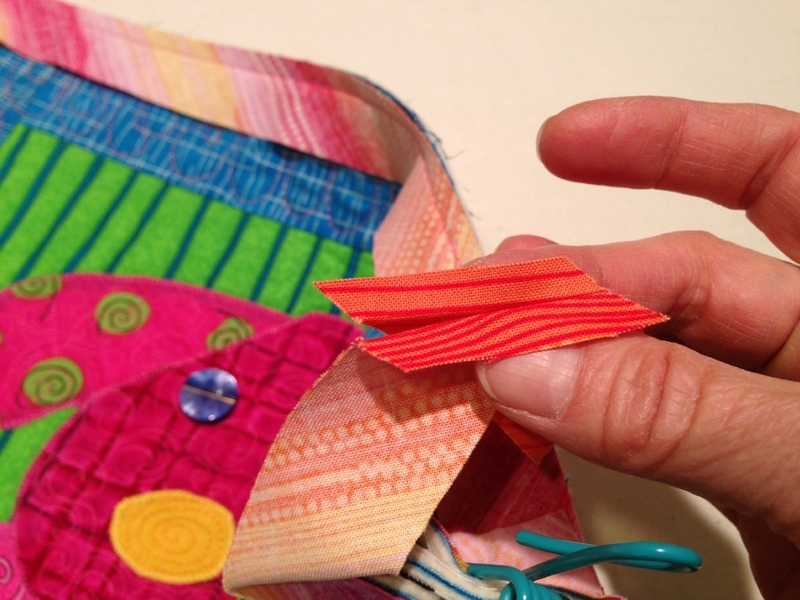 I love striped binding, but I usually run the stripes perpendicular to the edge of the quilt. So, I figured if I couldn’t remember doing a bias stripe binding with the stripes at a 45 degree angle, it was about time I did it again. Or for the first time. Amazing how much more waste there is cutting bias strips. I do like the way the hot pink binding pulses around the quilt. 2. 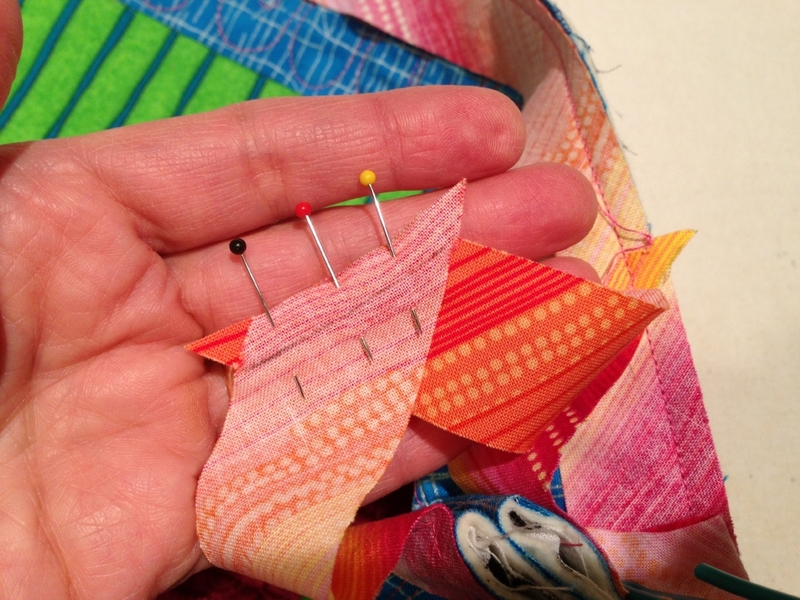 I wanted to see if I could stop quilting exactly 1/4″ from the edge of the quilt, so that the binding would touch the last stitch but not go beyond it. Not sure why that was a goal, but it’s not a very good one. I would have done better to sew off the quilt like I usually do. (I was “off” in as many places as I was “on.”) Discovering what doesn’t work is also learning. I’ll be including these also. What’s old to me might be new to you. 1. I pay special attention when I join binding strips (both to grow the binding long enough to fit all the way around the quilt, and where I join the two tails). I try to camouflage the joins by putting the seam in the same stripe or color on both pieces of fabric. Below is the final join, sewing the two tails together. I leave about 6 or 8 inches un-sewn and fold one tail up and the other down to form the miter. The ruler helps me make sure that the folds are really at 45 degree angles. I fold and re-fold, moving the folds in the tails along until I get to a place in the fabric in both pieces that is the same color. When I’m satisfied, I bring the folds almost touching and hit them with the iron. (The weight of the iron compresses the folds so they do touch.) Then, I mark a line in the valley of each crease (sewing line) and another line 1/4″ away toward the end of each tail (cutting line). … and stitch on the marked line that was in the crease. I know there are other ways to do this, but I like the control of positioning the seam exactly where I want it with regards to the color in the striped fabric. 2. All my Old Dogs will be wearing buttons for eyes. Buttons with shanks look more like eyes, but after you sew them they tend to flop around quite a bit. So, I don’t sew them. I safety-pin them on. 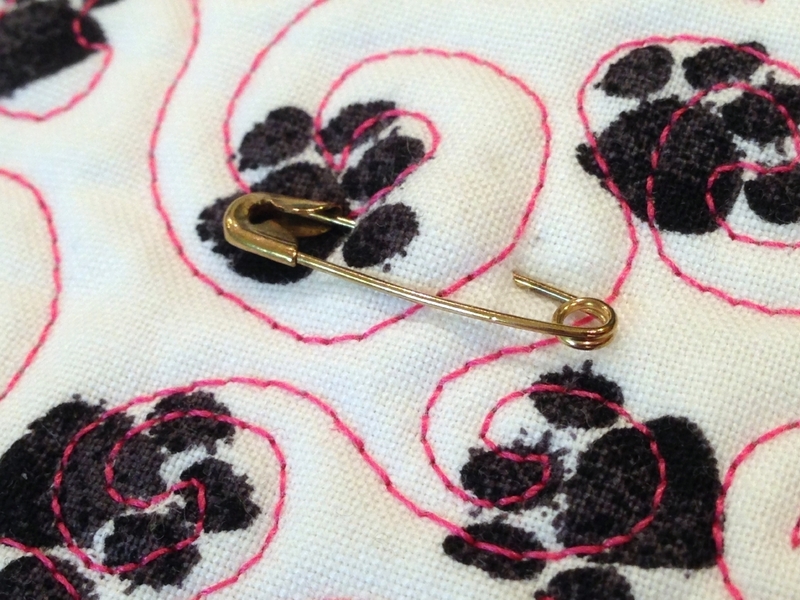 The safety pin draws the shank into the quilt so it won’t wobble. And I get the added benefit of changing my mind and swapping out one set of buttons for another, or just repositioning the eyeballs. I’m developing a new workshop called Beautiful Basic Binding for Beginners. I know; that’s a lot of B’s. Apparently I’m into alliteration. In preparation for my “guinea pig” class this spring I needed samples. I had originally thought of putting some really nice bindings on pre-quilted muslin squares (ick) but I just couldn’t bear to waste my time on it. So then, naturally, I went into “overkill” mode and thought I’d make five or six new quilts just for the class. Well, the class came and went, and I learned a lot! More on that some other time. Today I want to share the deconstruction of the UFO, what has become of the blocks, and why I am so excited about this project. Those of you who took my Puppus Doggus workshop at Houston Quilt Festival way back in 2002 might remember this quilt top. Still not quilted after 14 years, I figured it was fair game. At first I thought it was a little sad. I had spent quite a bit of time making the blocks, and sashing them together. I had also gone a little around the bend painting all the white dots in the border fabric purple. (The white stuck out.) Plus I had the backing fabric already pieced and the batting cut to just the right size. Should I have let sleeping dogs lie? Not with a seam ripper so close at hand. Besides it fit no known bed and was too large to hang on a wall. And, remember, I was on a mission. I may have backed into this particular project for all the wrong reasons, but it is turning out to be quite exciting. At first, my plan was to take one block, border it, and bind it. Done; next? But, as I sewed I kept thinking what a great opportunity this was turning out to be. Second, it was so much fun thinking of all the different ways I could bind each little quilt that I started thinking of all the different ways I could border the quilts too! YES! This is getting REALLY fun now! Third, as long as I was going to bind them and border them I realized that I should probably quilt them too. How many different ways could I come up with to quilt them? Finally, I could share all the quilts one at a time here on the blog so that I could challenge YOU to play along with me. Aren’t you glad you’re reading this? So lets recap, what do we get to learn, practice, experiment with, and have fun doing? Bordering, Quilting, AND Binding! Why am I so jazzed? We’re talking small quilts here. Small is “do-able.” Small is manageable. Small is why not take a risk and try something you’ve never tried before. What’s the worst that could happen? Comment below if you want to join this Old Dog and learn some New Tricks with me. Don’t worry, I won’t hold you to anything and, as with all my challenges, you can embrace them or ignore them—no guilt either way. The Old Dogs/New Tricks Challenge will begin officially with the next blog. If you have any suggestions, let me have them in the comments below. Just remember I get to embrace or ignore them too. Fair is fair.